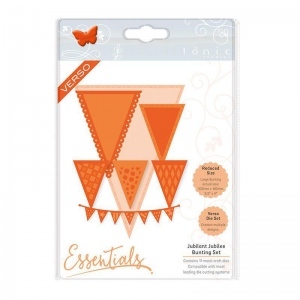 Create beautifully designed Bunting decorations with the Brand New Beautiful Bunting Die Sets from Tonic Studios. 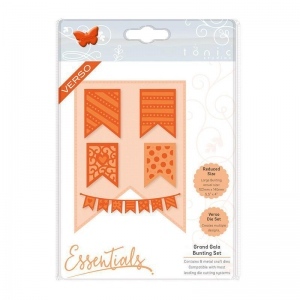 There are 3 dies sets in this brand-new collection and each has its own unique bunting design to add an extra celebratory element to your crafting project. The die sets in this collection are Verso, meaning each design gives to crafter two options. 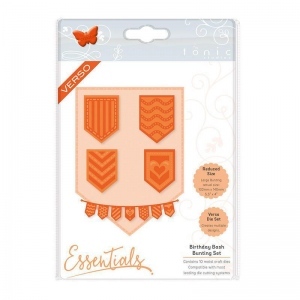 They can cut the Bunting out of the card, or they can also use the second die to cut more detail into the Bunting. The three die sets in this collection are 1796e Grand Gala Beautiful Bunting Die Set, 1797e Birthday Bash Beautiful Bunting Die Set and 1798e Jubilant Jubilee Beautiful Bunting Die Set. Being part of the collections range, these brand-new die sets are interchangeable with other die sets within the range.